Fit-Ink: Who's Ready to Run? Grab your running shoes. Grab your favorite summer running gear. Grab your Garmins, Nike+, Polars and other mileage logging devices. Tomorrow not only marks the start of June (yikes, where did the last five months go?) 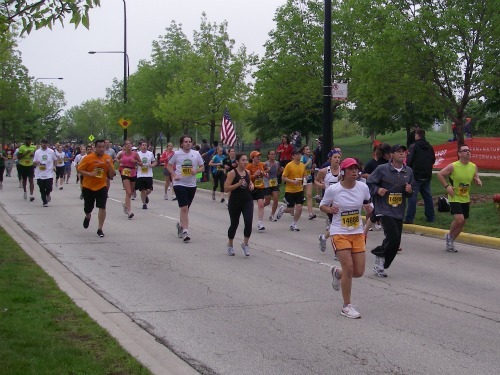 but it also marks the third annual National Running Day. You may not need an actual holiday to go for a run but Competitor Group, Inc. (CGI) wants to help you make the day even more worthwhile. When you're grabbing your must-have running items, you'll also want to grab your credit cards and computers. CGI is offering a one-day registration discount for its Rock 'n' Roll Marathon series, Muddy Buddy and TriRock events. Can we just say awesome? Basically any CGI event--and there are a lot roaming the country throughout the year--are discounted. Running, run/bike/obstacle relay, and triathlon (with music along the course, a rarity in the sport)--all your active bases are covered. The savings include $26 off a Rock 'n' Roll Marathon, $13 off a Rock 'n' Roll Half Marathon, $10 off a Rock 'n' Roll 10K, $5 off a Rock 'n' Roll 5K, $20 off a Muddy Buddy race, and $20 off a TriRock event. Now you can run the Las Vegas strip for $26 less, or the Virginia Beach boardwalk for $13 less. Or you'll save when you romp through the mud pit before crossing a Muddy Buddy finish line or rock out to a triathlon near a Civil War battleground. Ah, but wait, there's more. CGI also invites runners to log the miles they run today at competitor.com. Share your miles, share a story about why you run, download a badge to post on your Facebook page. Their goal is to hit 500,000 miles over these 24 hours of June 1. With marathoning and half marathoning participation numbers continually on the rise, that can't be too hard to hit. Who's going to get running?